Stop Guns In Domestic Violence! WLC, Sonke Gender Justice, and Gun Free SA (2015). Stop Guns In Domestic Violence! Women's Legal Centre, Sonke Gender Justice and Gun Free South Africa: Cape Town, South Africa. A national study found that more women (57%) were murdered by their husbands or boyfriends (called intimate femicide) than by strangers or criminals. Firearms, which are often said to be brought into the home to protect loved ones, played a major role in these murders, accounting for 17% of the cases seen. 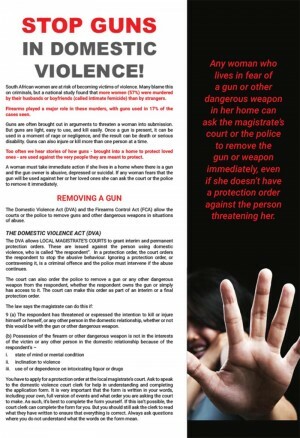 Any woman who lives in fear of a gun or other dangerous weapon in her home can ask the magistrate’s court or the police to remove the gun or weapon immediately, even if she doesn’t have a protection order against the owner of the gun. If you or someone you know is part of a relationship where there is a risk of violence, it is critical that you take immediate action and make sure the gun or other dangerous weapon is removed. This resource guide tells you how to go about having the gun removed from your home.